Fill up the form for further queries and information about Zimbra Email Solutions. Allow your users to use Microsoft Outlook in Mac OS X to synchronize Mailbox, Calendar, Contacts and Tasks with no additional Plugin. 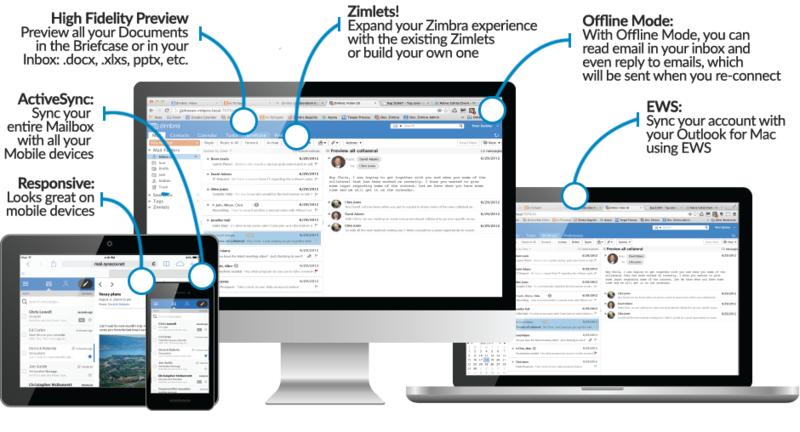 Zimbra Archiving and Discovery is an optional feature that enables you to archive messages that were delivered to or sent by Zimbra Collaboration and to search across mailboxes. Hierarchical storage management optimizes storage costs through tiered storage. Multitenancy enables service providers to cost-effectively support multiple businesses in a hosted environment. Real-time mailbox backup and restore to ensure your Business is Online, always. Out-of-the-box integration with Cisco and Mitel for click-to-call, visual voicemail, call record history, presence and instant messaging.